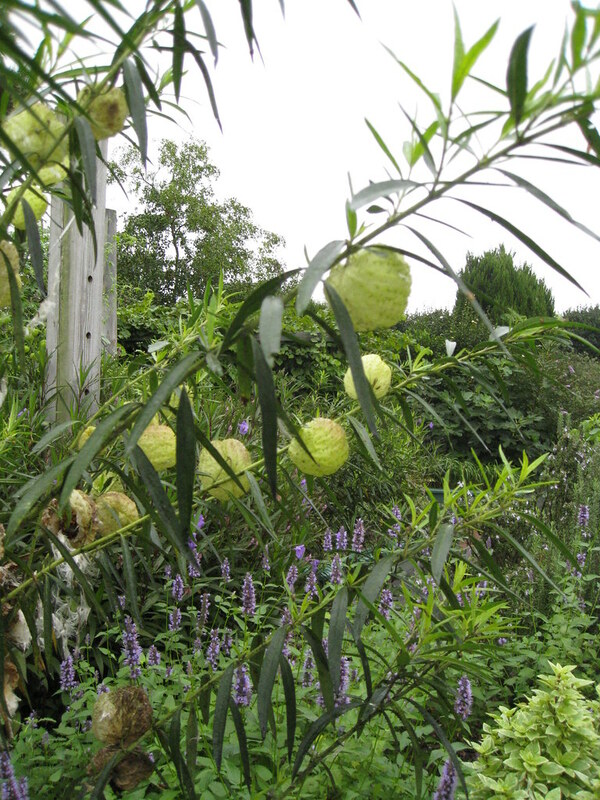 Welcome to the third and final post about the cool plants I saw at the 2009 Garden Writers Association conference! 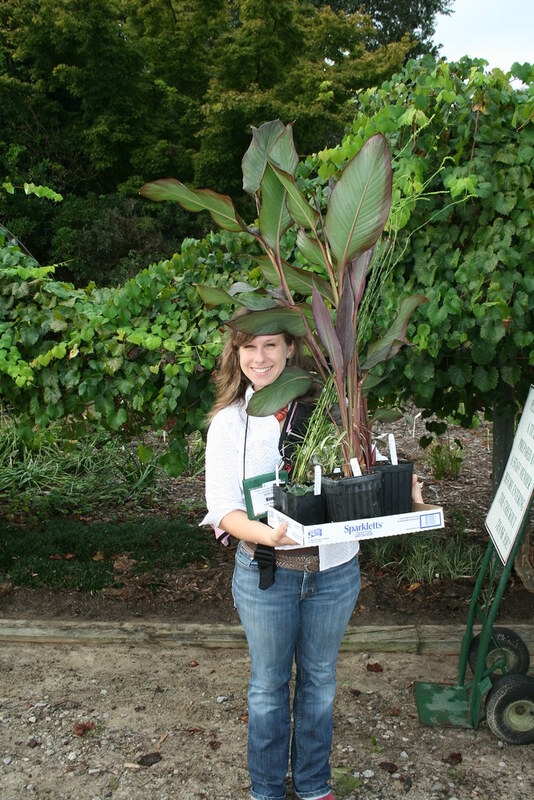 This time I'll be recapping what we saw at the JC Raulston Arboretum on the NC State University campus. I'll start by saying that we saw a ton of cool things, and I'll do my best to highlight them all. I'll also say that it was pretty nasty while we were there -- overcast and drizzly -- so not all of the photos are the best. The first photo shows some inventive planters that we eventually saw in the trials garden. I'm pretty sure they were just sections of drainage pipe that had been painted. 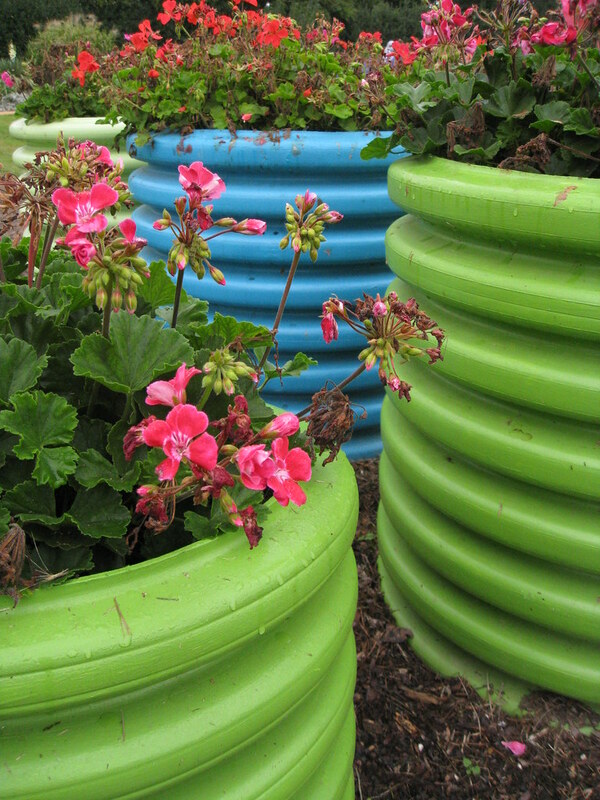 Colorful, cheap, and affordable -- all good things in my gardening world! 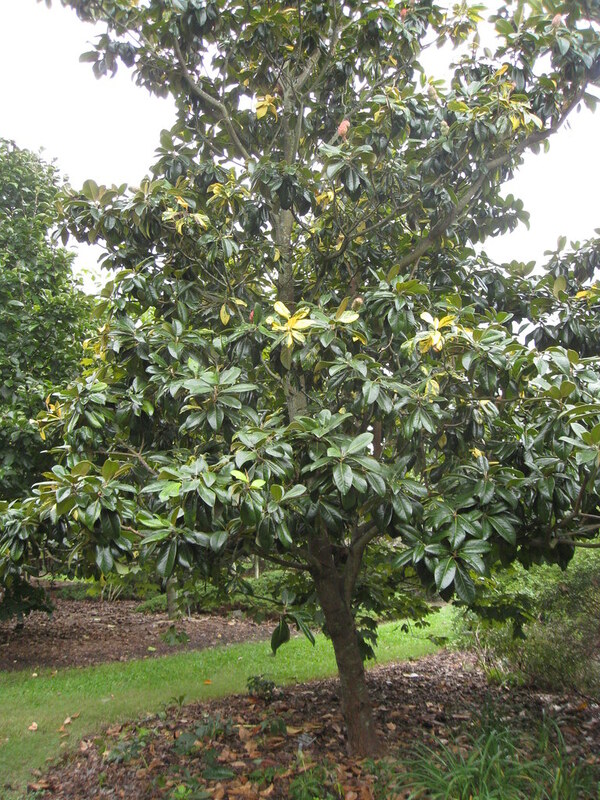 Emily and I officially started our tour looking at some of the trees, including this cool magnolia. Can you believe that it has variegated leaves? It was hard to get a good picture since it is a full-sized tree, but I think you can see some of the yellowish leaves. 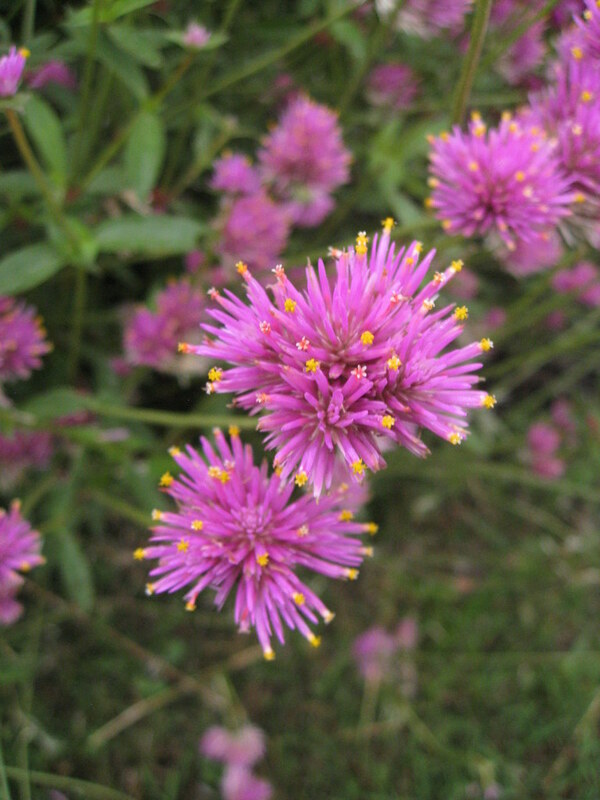 Once we made it to the bedding plant trials garden, I fell in love with Gomphrena spp. 'Fireworks'. The flower heads had much more interest than a typical round Gomphrena flower, and the plants themselves were quite thick and robust. I might need to buy myself some seeds from Burpee next year and give this one a try. 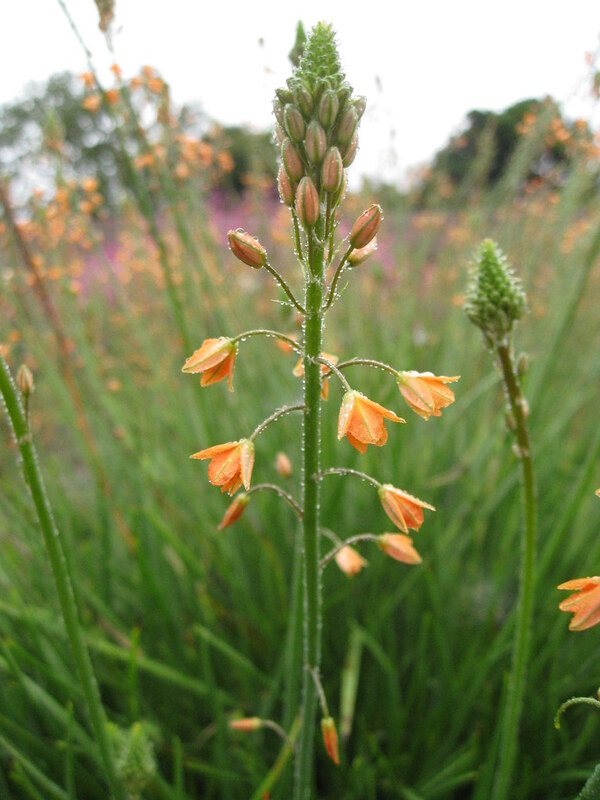 This orange bulbine was really beautiful. It was taller than the yellow bulbine that I'm used to seeing around here and had denser foliage. I could totally see myself using it in my garden somewhere. And check out this odd-looking plant! Apparently it's a milkweed family plant called Gomphocarpus physocarpus. The seed pods were really cool, so much so that Emily and I both ran over to look at it as soon as we laid eyes on it. It was pretty tall, too -- maybe 6 or 8 feet. Very striking. This is what they called the lath house. I liked that it seemed like a clever and easy way to create a shade house by creating a framework with standard lumber and then topping it off with wood and wire snow fencing. Again, easy and affordable -- both good things. 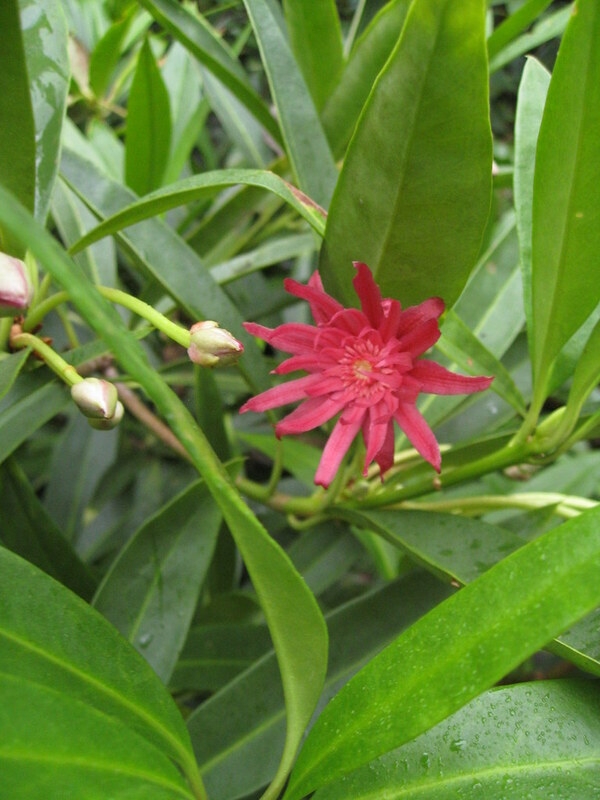 We saw Illicium mexicanum 'Aztec Fire' in the lath house, and boy, was it hot! The leaves of the plant looked like our own native Florida anise, but the red flowers made it so much better. The sign said that it's native to Northeast Mexico. 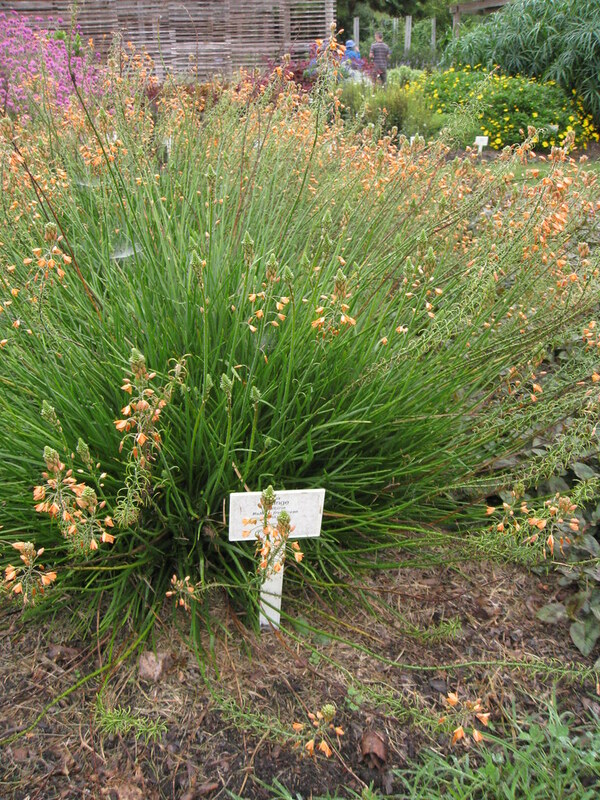 Apparently it's commercially available and is suited for Zones 8-9, so maybe I'll have to give it a try. Finally, we saw a lot of cool succulents in the rooftop garden and the xeric garden. The one on the left is similar to the one that I bought at Plant Delights Nursery. It was only a foot or so tall. 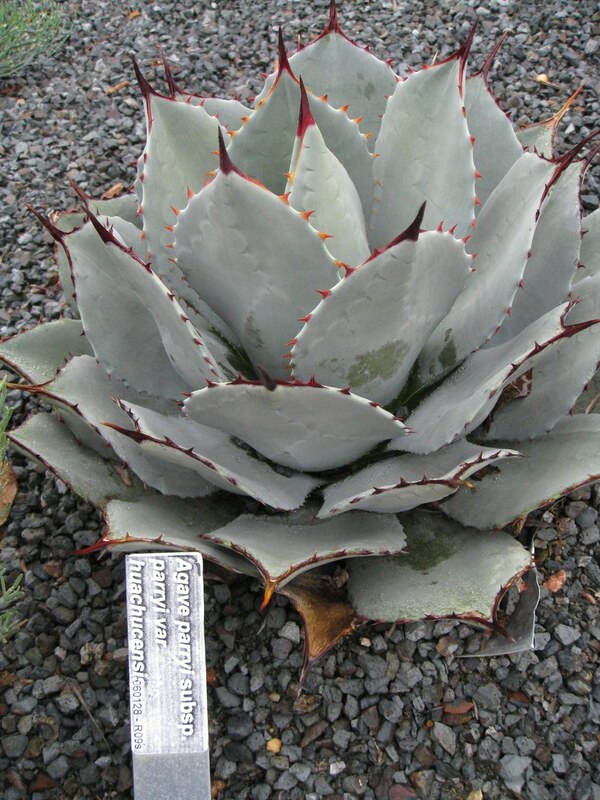 The one on the right was Agave 'Mr. Ripple'. That's all for the 2009 GWA updates. Come September, I'll be heading to Dallas for this year's conference. Can't wait! As promised, here's the second installment of the recap of the cool plants I saw during the 2009 Garden Writers Association Conference. 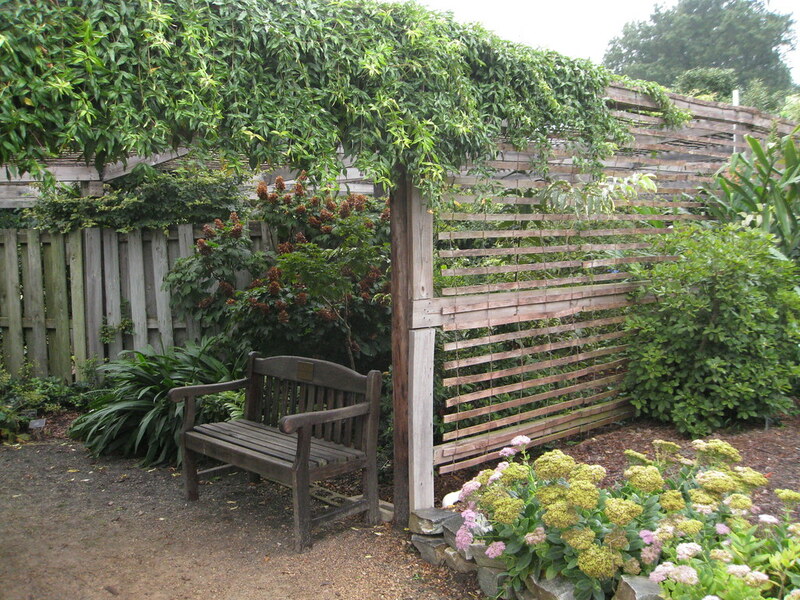 Our second set of tours took us to holy ground -- Juniper Level Botanic Garden at Plant Delights Nursery. If you don't know, the Plant Delights catalog is THE catalog to drool over every spring. Plantsman Tony Avent keeps it packed full of interesting and exotic plants that plant geeks everywhere love to covet. Plus, he has a great sense of humor. 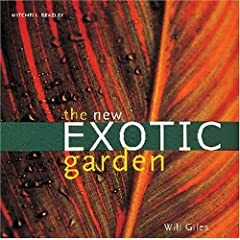 How many other catalogs do you know that stock cultivars like 'Get Nekkid', 'Red Neck Heaven', 'Elvis Lives', and 'Bubba'? Interestingly, I wasn't the only one to be smitten by the solidago. Several people I know picked up this plant. It's funny because the plant was not on my must-have list at the beginning of the morning. I've never so much as circled it in the catalog. (Note: I just realized that's because it's only offered at PDN open houses and online.) But we saw it in bloom in the garden and it was just gorgeous. The leaves are much less prominent than what I usually associate with goldenrods (even less so than the image on the PDN page), so the form is much more striking. Plus it was in bloom, and any nurseryman knows that customers are suckers for plants in bloom. I had plenty of cannas to choose from. 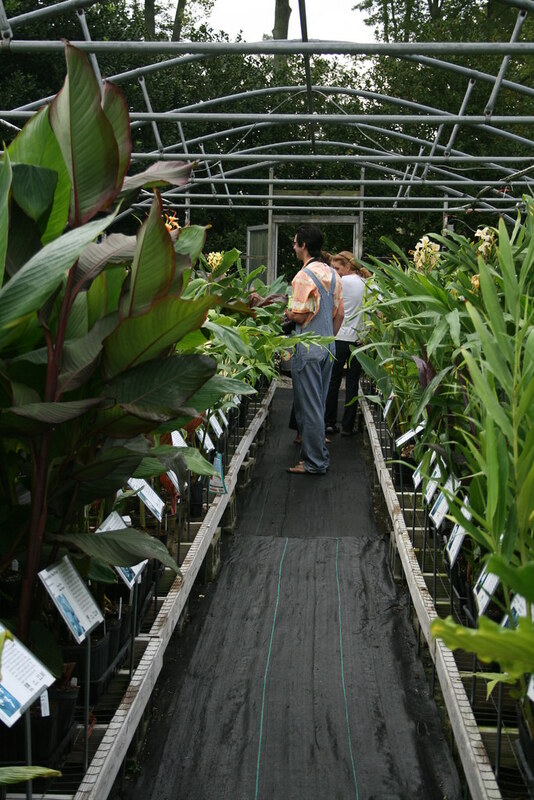 In fact, this entire aisle was full of cannas! It's a wonder that I came back with only two varieties. Damn budget. 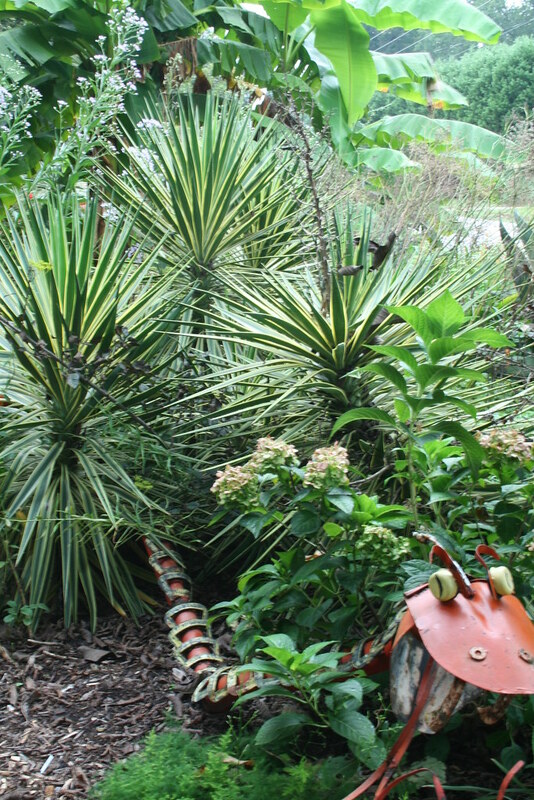 The garden featured several whimsical touches, like this dragon coming out of a grouping of yuccas. Apologies for the blurriness, but this was an early morning tour. I'll say that it's because the lighting was low, but it could've been that I was still waking up. Speaking of whimsy, Tony Avent even created his own mountain on premises, dubbing it "Mount Michelle" after the famous Mount Mitchell in the Piedmont area of North Carolina. 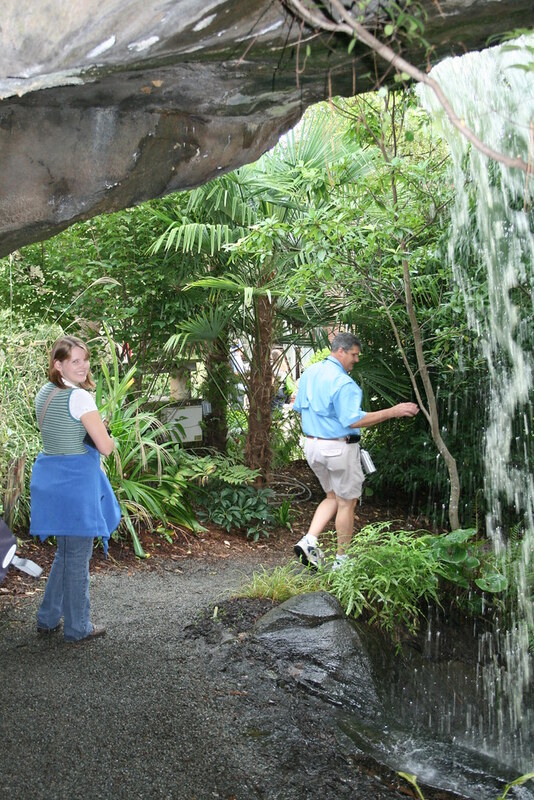 Here's a shot of Emily and Tom walking under that waterfall on Mount Michelle. 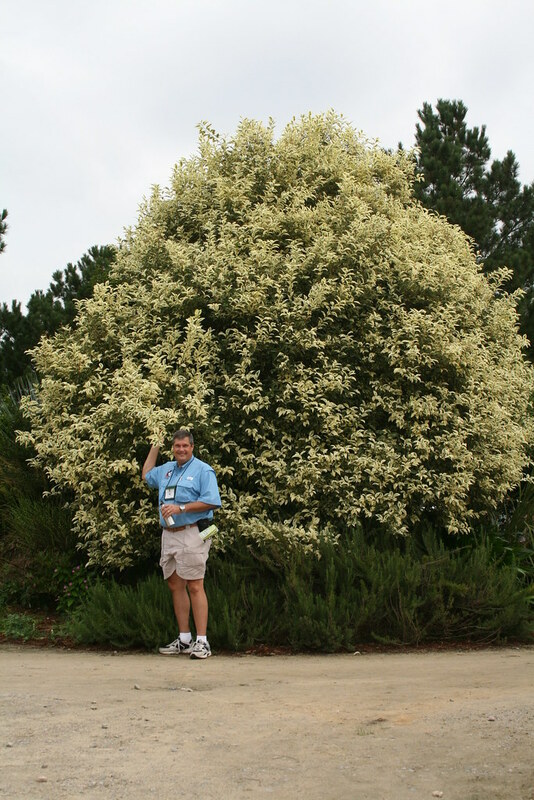 Tom insisted that we take his photo in front of this variegated ligustrum. Yes, the light coloring isn't flowers -- it's the leaves. And can you get over how big it is? 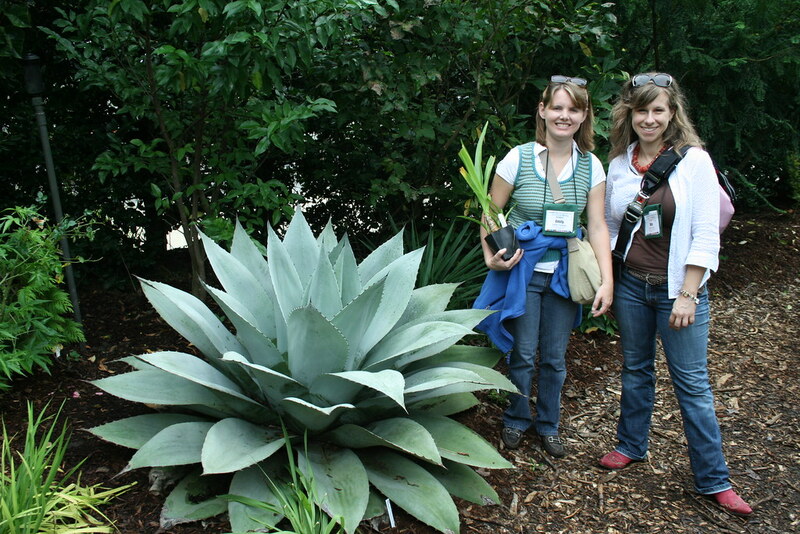 And speaking of big plants, check out this agave. Sure, Emily and I aren't exactly the tallest gals around, but this thing really was huge, I swear! 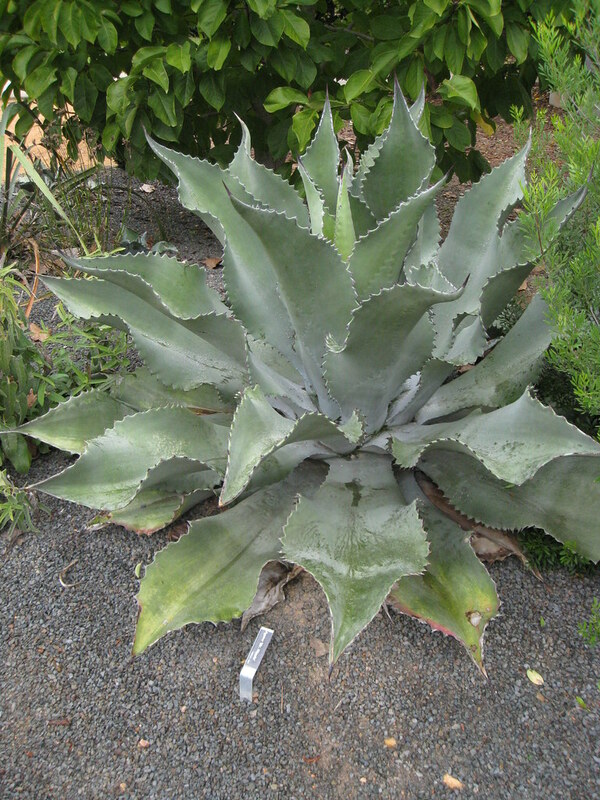 I really liked this plant, which was just around the corner from the agave. 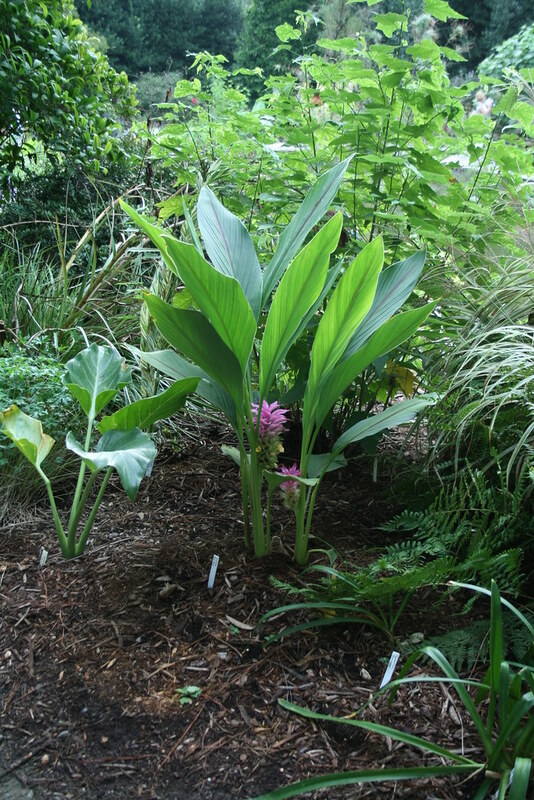 I think it might be Curcuma zedoaria 'Bicolor Wonder'. If so, it should get up to 72" tall. I might have to try this in the shady part of my front bed to give it a tropical punch. Well, those are my favorite photos from PDN. We spent the other half of the tour at the North Carolina Farmers' Market. I bought a small Albizia julibrissen 'Chocolate Summer' there, which made me sooooo happy, despite the $40 price. I have wanted to have a 'Chocolate Summer' mimosa since 2007 when I first saw one in Oklahoma City. Yes, I know that the species type is invasive here in Florida. I'm hoping that the fancy cultivar will be less aggressive. If need be, I'll cut off the flowers before they set seed. I just had to have it! I didn't take many photos at the farmers market -- just a few fall-inspired shots of pumpkins for sale. I'm not going to bother posting those, since I know that you guys don't come here for pumpkins. You want photos of bold and beautiful plants! Swing by later and I'll have another post that's chock full of beautiful plant photos from our visit to the J.C. Raulston Arboretum.